Laptop Dell Latitude 6430u won’t turn on, won’t power on, there is no display, just a black screen. This is a general diagnostic and repair steps to fix those problems. Battery has no charge left + AC adapter failed; you press the power button on laptop Dell Latitude 6430u nothing happens, laptop won’t turns on and there is no display, the battery has no charge left, the motherboard doesn’t receive any power, laptop cannot turn on. You plug in the AC adapter but that doesn’t help, your laptop Dell Latitude 6430u still won’t power on, there is a chance you have failed AC adapter. In this case try with another charger or check AC adapter with a Multimeter. If it’s dead, replaced with a new one. Power circuit in wrong state or Over volt protection trips; you press the power button but nothing happens, laptop Dell Latitude 6430u won’t turns on and there is no display just a black screen, your laptop has static electric charge made power circuit in wrong state. Unplug AC adapter, take out the battery and hold down power button for 30 seconds, the static charge will dissipate. Plug in the AC Adapter and turn on your laptop Dell Latitude 6430u. This should restore the system to normal operating mode. Hardware failure; the laptop powers on, but there is no display just black screen with Power led lights ON or your laptop Dell Latitude 6430u stock on logo or restart. In this case, it’s possible one of the Hardware failed. You can try to disassemble the laptop to bare minimum and try to reseat the hardware one by one and power on the laptop every time you reseat a hardware, to know the failed one, replace the faulty hardware. Screen faulty or bad video cable connection; laptop Dell Latitude 6430u turns on, but screen is black, with Power led lights ON. Test the laptop with an external monitor connected to the HDMI port, VGA port, press the appropriate key to switch to it. If the external monitor works fine and load the operation system, most likely you have a faulty screen or bad video cable connection. Check them and replace the faulty one. BIOS failed; Laptop Dell Latitude 6430u won’t turn on at all, if the voltage 19V, 3.3V, 5V OK and electronics components on the motherboard are good, there is chance you have failed BIOS. There is a signal test confirmation on EC/SIO pin name RSMRST# . This pin must available 3.3V(tolerance 10%) than Bios Confirmed OK. If the test failed reprogram or replace the BIOS chip. 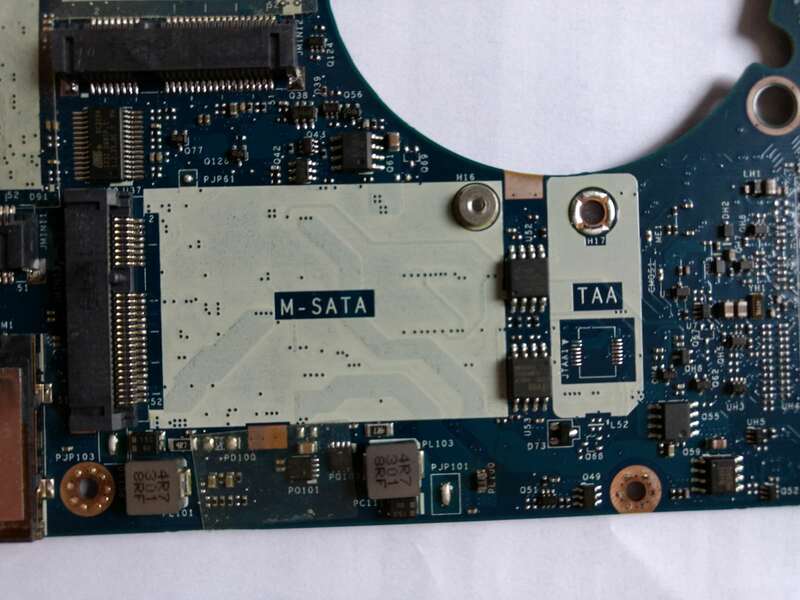 Laptop Power System has problem: Laptop Dell Latitude 6430u won’t turn on at all, probably some electronics components or chipset on the motherboard failed; Disassemble the laptop and take out the motherboard. Ceck No burnt marks visible on the mainboard. Check chepset temperature (CPU, GPU, Power-Supply IC …). Check power jack. Check motherboard receives 19V. with a Multimeter measure voltages on coils, check for any components shorted to ground. checked 3.3v/5v is up and running? Will need an electronic boardview or Schematic Diagram for Laptop Dell Latitude 6430u. The failed electronic component has to be replaced. Motherboard dead; The Dell Latitude 6430u motherboard has to be replaced. For other Dell Latitude 6430u problems check the comments or write a comment. This entry was posted in Dell and tagged Dell Latitude 6430u, Dell Latitude 6430u AC adapter problem, Dell Latitude 6430u Battery problem, Dell Latitude 6430u BIOS problem, Dell Latitude 6430u black screen problem, Dell Latitude 6430u blinking led issue, Dell Latitude 6430u common faults, Dell Latitude 6430u common problems, Dell Latitude 6430u dead how to repair, Dell Latitude 6430u deads solution, Dell Latitude 6430u does not work, Dell Latitude 6430u fail to power on, Dell Latitude 6430u failed to turn on, Dell Latitude 6430u Hardware problem, Dell Latitude 6430u motherboard power problem, Dell Latitude 6430u motherboard problem, Dell Latitude 6430u motherboard troubleshooting, Dell Latitude 6430u no display problem, Dell Latitude 6430u no lights except dc jack, Dell Latitude 6430u no power lights, Dell Latitude 6430u not charging, Dell Latitude 6430u not powering on, Dell Latitude 6430u not working, Dell Latitude 6430u Power button problem, Dell Latitude 6430u power failure, Dell Latitude 6430u power issue, Dell Latitude 6430u power system problem, Dell Latitude 6430u restart problem, Dell Latitude 6430u Screen flickering problem, Dell Latitude 6430u shutdown problem, Dell Latitude 6430u stocks on logo problem, Dell Latitude 6430u video cable problem, Dell Latitude 6430u video card problem, Dell Latitude 6430u white screen problem, Dell Latitude 6430u won’t boot problem, Dell Latitude 6430u won’t power on problem, Dell Latitude 6430u won’t start up problem on November 9, 2016 by helpmate. Hello and thanks for this guide! I found a burned capasitor on my motherboard. It says PL100 does anyone know which capasitor it is so that i can get a spare one and replace it? It looks like a ceramic decoupling capasitor (see picture). First I think its a coil like PL101 and PL103 not a capacitor. Second Look for shorted FET usually SOIC8 package. And check the motherdoard For short circuit. Thanks for your help so far, and you are right having a closer look it’s a coil. Unfortunately I don’t know which of the shorted FET could be linked to it and has to be taken out. I found the connection diagrams but I don’t know if it is possible to test if they are working and so to find out which one it could be.